Yes, the classic bring-a-plate style spread of baked goods and dips is the standard celebration in many offices, for obvious reasons. It doesn’t cost any money for the company, doesn’t take a lot of time, and can all be done in the office. It’s a perfect way to have fun without affecting the bottom line. However, such celebrations always raise the question of what to bring? Do you spend half the night slaving over a multi-layered torte topped with tempered chocolate sculptures, or just pick up a packet of crisps on your way in? Can your morning tea offering affect your reputation in the office? There is significant value in making something from scratch. Firstly, it shows that you have interests and talents, outside of work. If you can demonstrate that you know how to whip up a decent pan of brownies, it marks you as someone with more on your mind than just the fortnightly KPIs. Secondly, it shows that you care about your workmates. If you are willing to spend time on creating something special for the people you work with, even when you don’t have to, is a fantastic sign of commitment. It’s a type of teamwork that always looks good to an employer. I’m not saying you should go overboard. There is a limit to how much time and money you need to spend on what you make. No one expects a croquembouche. As long as you make it yourself, it is best to stick to something simple that everyone will love. The first decision is whether to go sweet or savoury. Most people’s minds go straight to the cakes and cookies, but don’t discount the less sugary options. Few things get devoured more readily than small, savoury pastries. 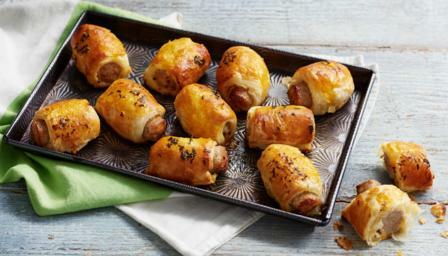 Think mini-quiches, or a homemade sausage rolls. Some well-seasoned and spiced pork or beef mince wrapped in puff pastry and baked till golden will always be a success, and couldn’t be easier to make. If you do go down the sweet route, sticking to the favourites is the easiest way to go. Classic cupcakes are hard to beat, but if you can make a proper macaroon you’ll be in everyone’s good books. In the end, though, you need to take cues from your workplace. If everyone is on a health kick, maybe go something with a little less sugar and fat (although I’ve always found that most diets temporarily go out the window around morning tea time). If it’s a competitive office, maybe go a little more complicated to really wow the joint. Just make sure that, if you do bring something impressive, you are willing to do it again. Once you’ve set that standard, you’ll never be allowed to drop. Whatever you decide to go with, providing something delectable for a morning tea is an easy, fun way to get noticed, and to make friends. And even if it doesn’t get you that promotion, at least you get something nice to eat.